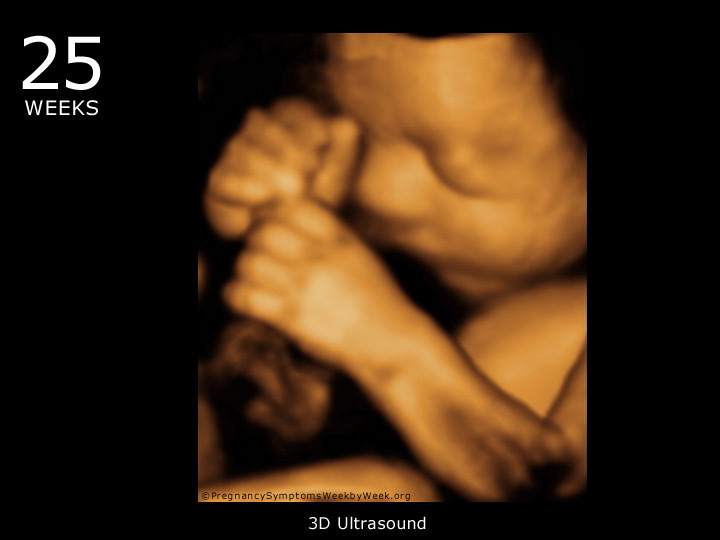 The 25th Week of Pregnancy Signifies the End of Your Second Trimester! 111 DAYS TO GO. . . This marks the end of the second trimester. The rest of your pregnancy will pass before you know it. Make sure you have all the practicalities in order, such as deciding a date to stop working. You may also want put some thought into finalizing your birth plan and all of the logistics of the birth. You can save time the day of the birth by registering at the hospital in advance. 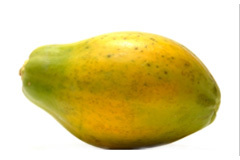 Your baby is about the size of a papaya during week 25. The Brain is growing rapidly as the cells are dividing and maturing. Already it can learn and remember. The Mouth is moving frequently and yawns regularly to regulate blood and fluid in the lungs. The Ear bones have hardened, so hearing is more acute. Your baby can now recognize its mother’s voice. However, since the ears are more sensitive to deeper sound waves, your baby may hear their father’s voice more easily. Body Fat is increasing daily, which will make the skin look smoother and less wrinkled. Friends and family will no doubt be monitoring your growing belly with interest. Try to be patient if they bombard you with advice and don’t listen to too many tall tales about pregnancy and children. Your body is working really hard right now, so take some time to enjoy some pampering while you still have the time. When booking appointments for massages or other pampering, always let them know that you are pregnant. From this point onward, babies grow at an individual rate, which is largely influenced by their genes. 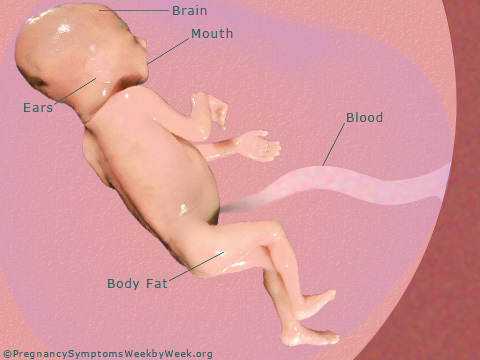 The proportions of your baby’s body are becoming much closer to those of a newborn baby. Still very skinny, your baby is now starting to fill out more as fat reserves continue to be laid down. Up until this point most babies are approximately the same size and weight. Genetic and especially environmental forces increasingly dome into play, influencing how quickly your baby can grow and whether his full growth potential is eventually reached.